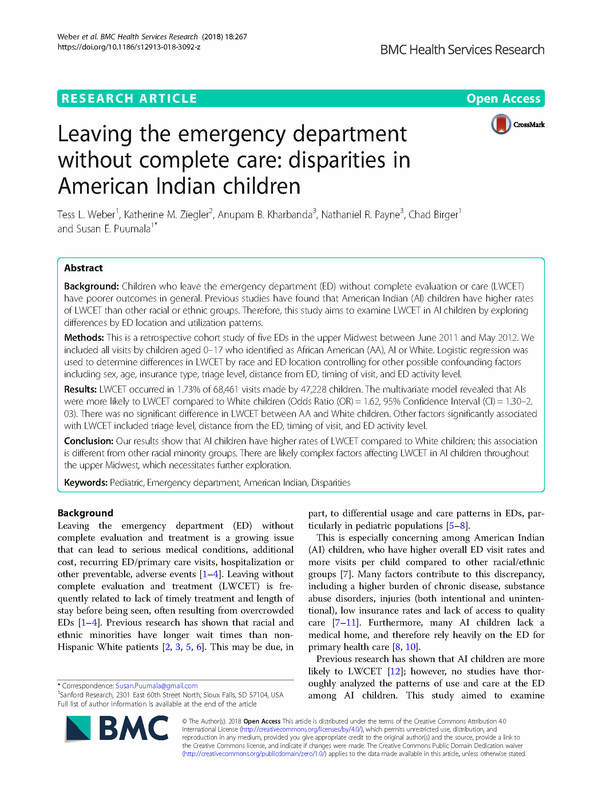 Many AI children use hospital and clinic emergency departments (ED). Not much research has been done on this topic. 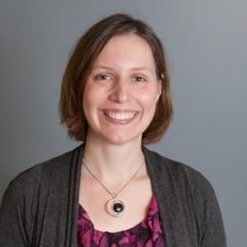 The little that exists suggests that AI children increasingly use the ED and increasingly leave the ED without receiving care, or the right kind of care. 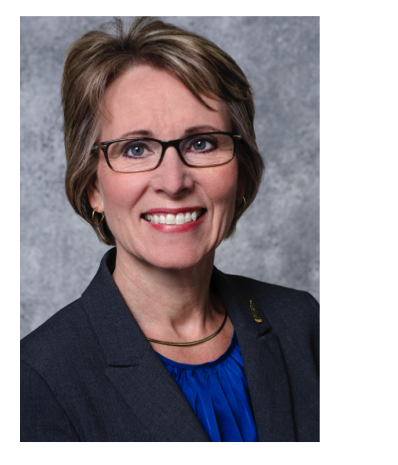 This study will increase the understanding of patterns of ED use and care for AI children in the Upper Midwest. It will also develop interventions. 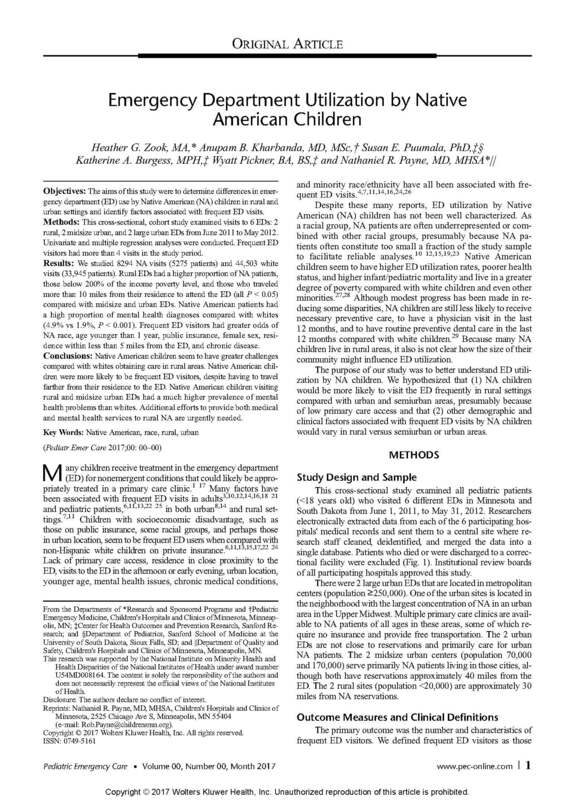 Aim 1: To assess the patterns of utilization and care among AI children in the Upper Midwest. 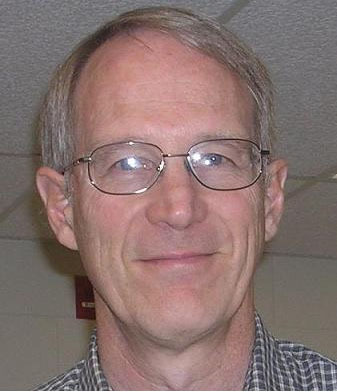 Aim 2: Develop an understanding of community attitudes towards ED use by AI children who reside within the Upper Midwest. Aim 3: To develop and pilot test novel strategies to target institutional and community practices to improve ED utilization and care for AI children. Zook, H. G., Kharbanda, A. 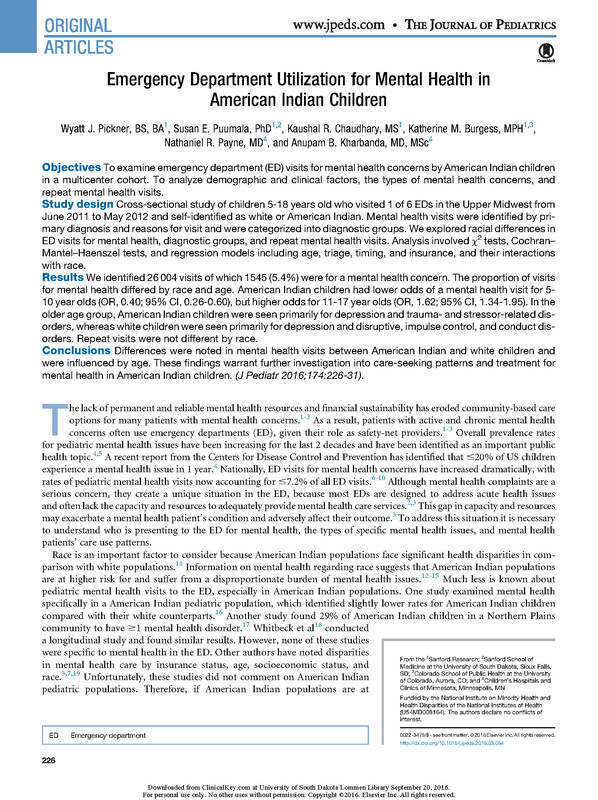 B., Puumala, S. E., Burgess, K. M., Pickner, W. J., & Payne, N. R. (2016). 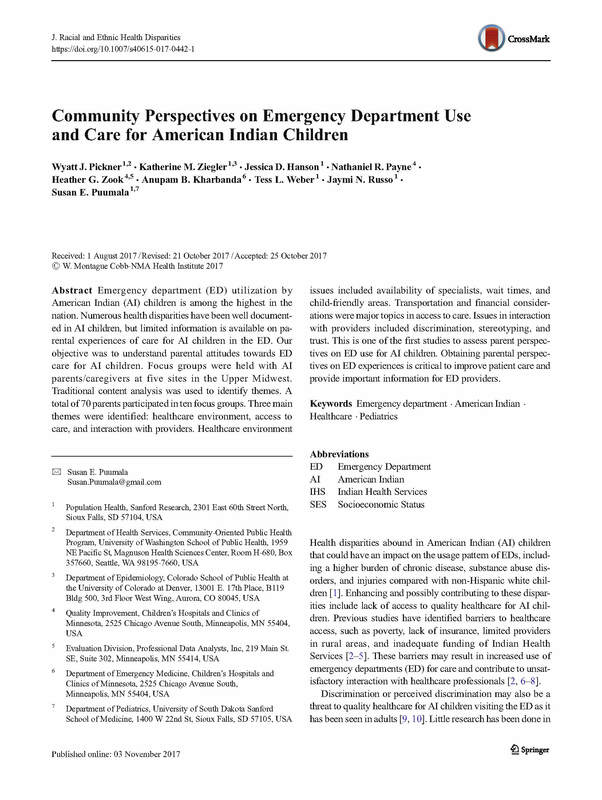 Emergency Department Utilization by Native American Children. Pediatric Emergency Care. Zook, H. G., Payne, N. R., Puumala, S. E., Burgess, K. M., & Kharbanda, A. B. (2017). 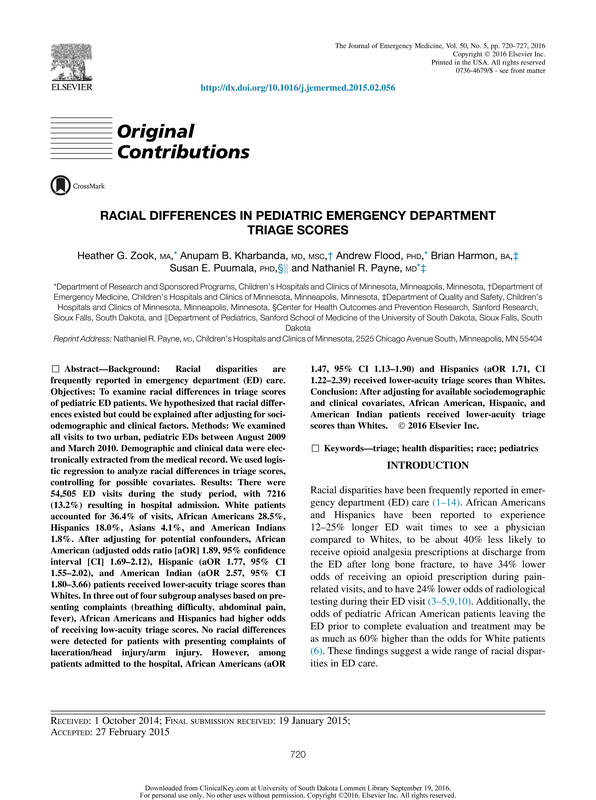 Racial/Ethnic Variation in Emergency Department Care for Children with Asthma. 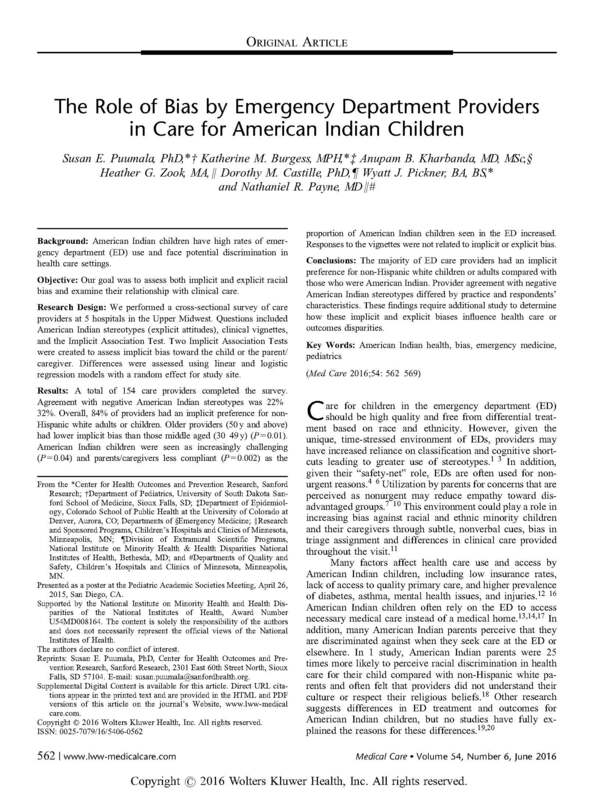 Pediatric Emergency Care. Nickel, A. J., Puumala, S. E., & Kharbanda, A. B. (2018). 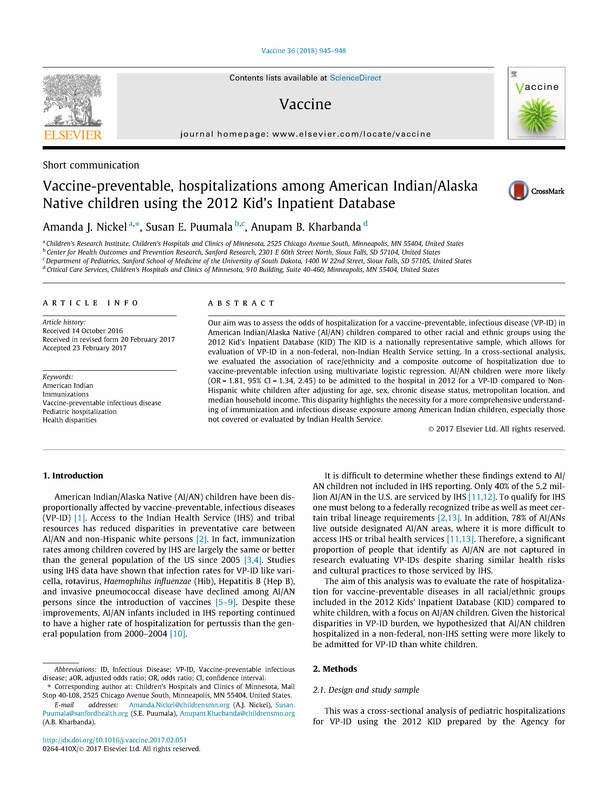 Vaccine-preventable, hospitalizations among American Indian/Alaska Native children using the 2012 Kid's Inpatient Database. Vaccine, 36(7), 945-948. Click HERE for ED Study trainings and videos. AI/ANs have the highest prevalence of Type 2 diabetes of any U.S. racial minority. They also have a high rate of end-stage renal disease. Living kidney donation and transplantation (LKDT) could save lives, but there are many cultural, geographic, and economic barriers to learning about it. This project will use an interpersonal approach and story-telling to present LKDT information. The target audience will be AI/AN people on renal dialysis who are eligible for transplant. Aim 1: Conduct a formative study to assess the knowledge, attitudes, and beliefs about LKDT among AI/AN dialysis patients who have not been identified as ineligible for renal transplantation using in-depth interviews. Aim 2: Develop a culturally-targeted intervention for AI/AN dialysis patients focused on knowledge of LKDT and how to have a conversation with family members about living donation. 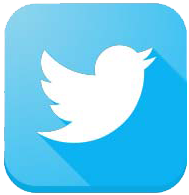 Aim 4: Create a social media campaign for American Indians that targets highly influential social media users. 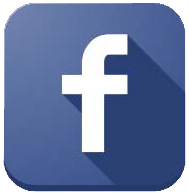 Sub Aim 4-A: Create social media campaign materials using existing materials from the Hope and Healing intervention, informed by evaluative interviews with participants exposed to the original campaign materials. Sub Aim 4-B: Conduct a social media campaign via Facebook, Twitter, and Instagram and track message dissemination through social networks. 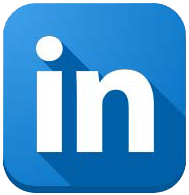 Sub Aim 4-C: Identify and target highly influential social media users with tailored campaign messages that those users will personalize and share within their spheres of online interpersonal influence. "Hope and Healing Through Living Kidney Donation and Transplant"
Asthma is complex and affected by many environmental and psychosocial factors. Asthma and mortality from asthma are highly prevalent in minority and disadvantaged groups, and we donΓÇÖt fully understand why. This project will study pediatric asthma and will include a broad range of factors: genetics, immunity, environmental exposures, education, economic resources, access to and use of medical care, and perceived quality of life. 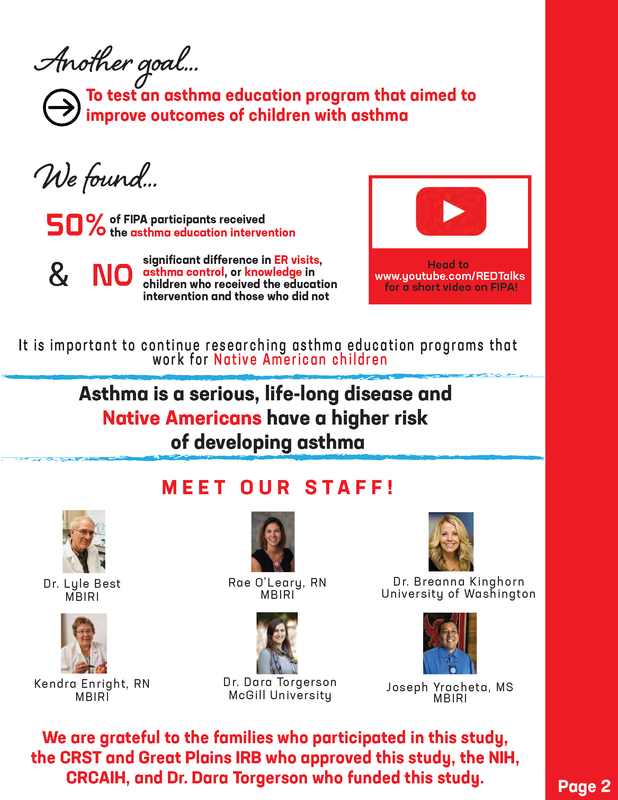 In addition, half of the cases will receive intensive asthma-related education. 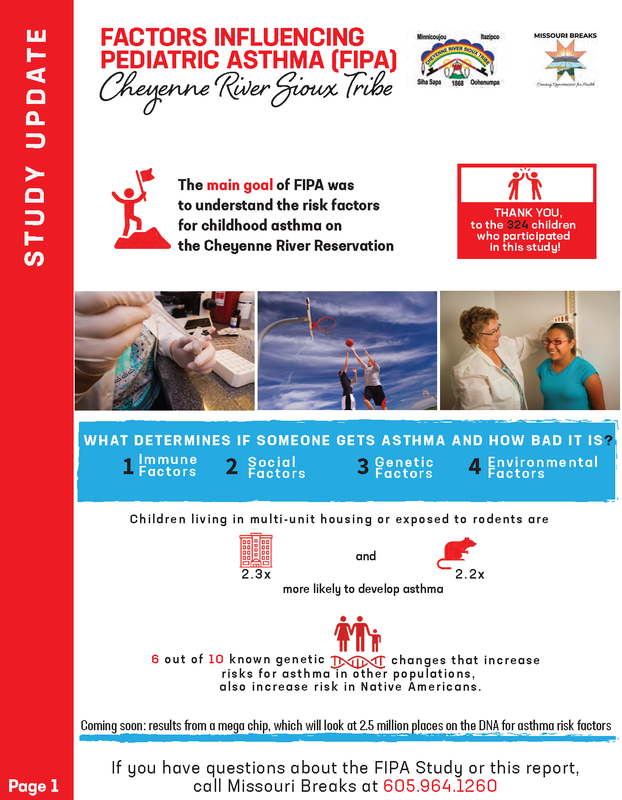 Aim 1: Characterize the influence of risk factors and the resulting disability of asthma in the [ ] Sioux community utilizing a case/control methodology. Aim 2: Test the hypothesis that intensive patient education regarding self-directed, stepped care will result in reduced morbidity and medical care utilization, while increasing quality of life. 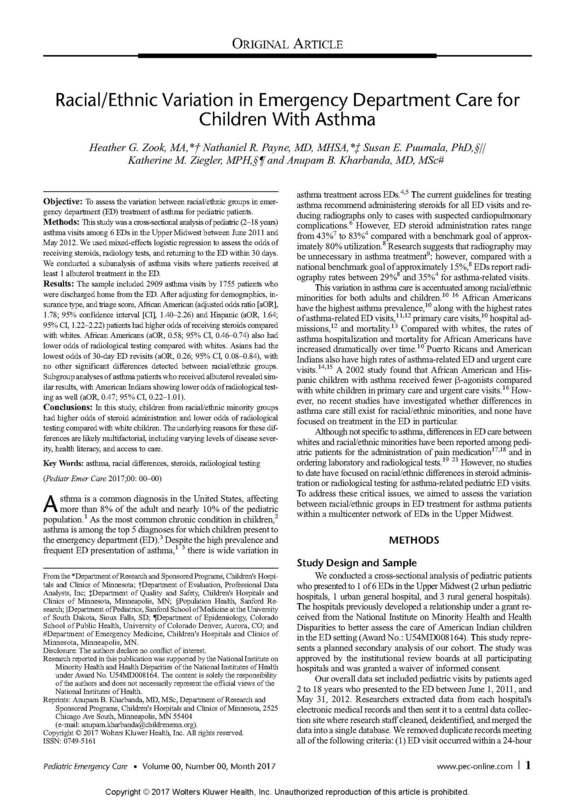 Aim 3: Explore and test various hypotheses regarding associations between certain genetic polymorphisms and risk of asthma or response to medication. Aim 4: Improving the understanding of research methods and encouraging young American Indian students to consider careers in biomedical fields. Best, L.G., Azure, C., Segarra, A., Enright, K.J., Hamley, S., Jerome, D., O'Leary, M.A., O'Leary, R.A., Parisien, A., Trottier, K., Yracheta, J.M., Torgerson, D.G. 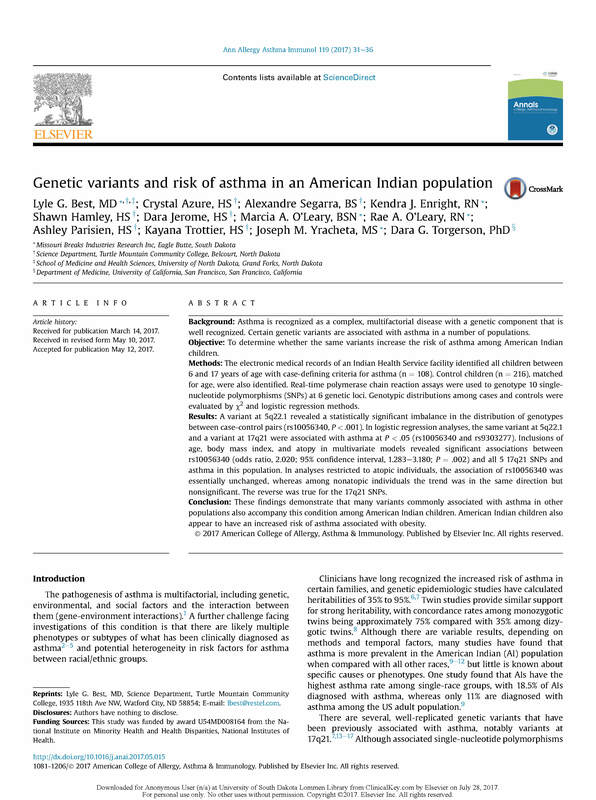 Genetic variants and risk of asthma in an American Indian population. (2017). 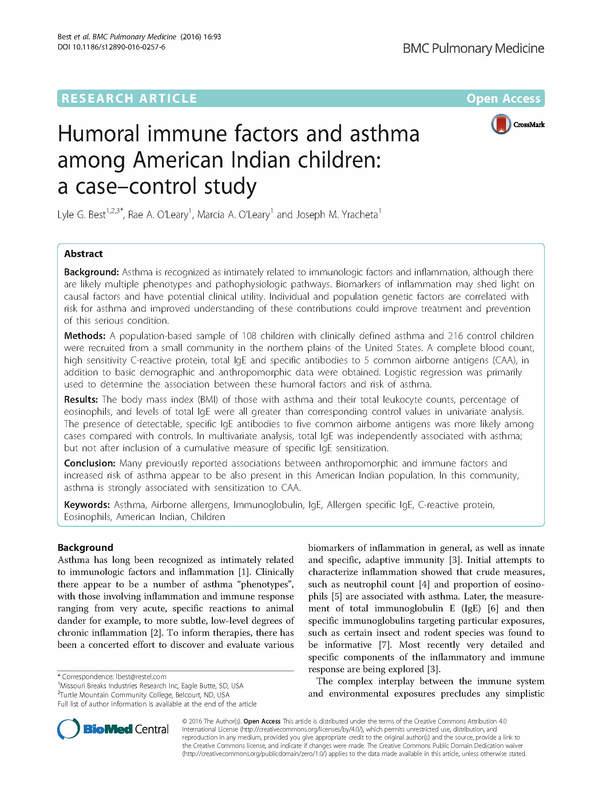 Annals of Allergy Asthma and Immunology. 119(1):31-36.e1. doi:10.1016/j.anai.2017.05.015.